Cristóbal de Villalpando was one of the leading painters in New Spain at the end of the 17th century, measured by the number and prestige of the commissions he was awarded. He painted this large biblical scene at the peak of his career. 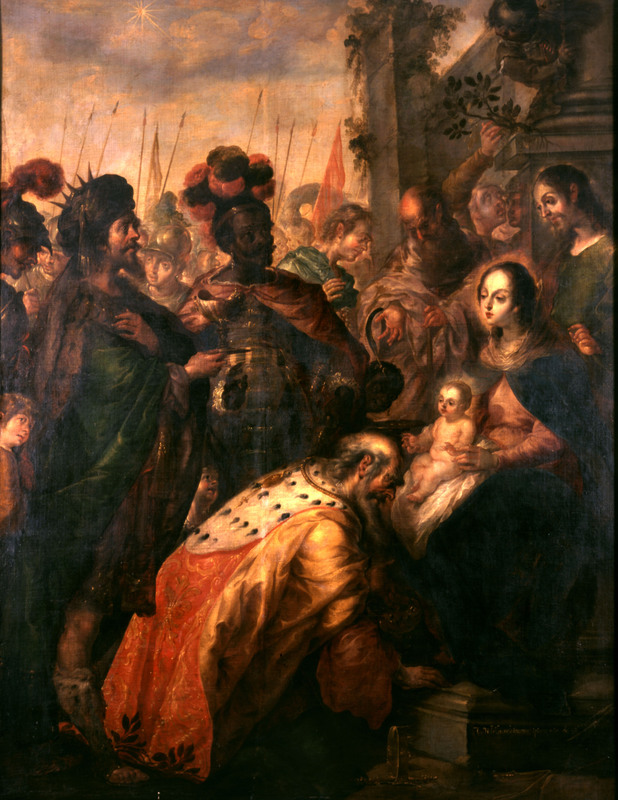 The painting shows a scene mentioned in the gospel of Matthew when kings, or magi, visit the infant Jesus. In medieval depictions, the three kings often personified the three parts of the known world—Europe, Asia and Africa. Thus Balthazar, one of the kings seen at the center of the painting, is traditionally portrayed as black. Like other painters of the day, Villalpando turned to engravings of European paintings as inspiration for his work. This one was indebted to Peter Paul Rubens’ works of the same title, which were engraved in the first half of the 17th century. However, the painting is distinguished by the stylistic trademarks of Villalpando, including the tapering fingers of his subjects, which almost end in a point. Cristóbal de Villalpando (ca. 1649-1714), a leading painter in Mexico City, had a large workshop that turned out commissions for churches as far south as Guatemala. Many of his paintings, like this one, were large works, and parts of narrative cycles. His most important commission was for the paintings in the Sacristy of Mexico City’s cathedral. This work is oil on canvas. If one looks at the edges of the original, it becomes clear the painting has been cut down at some point in the past, and now is narrower than it was originally. The original location of this painting is not known. It seems to have been brought to the United States by members of the Jesuit order who traveled to Mexico in the late 19th century on a “begging tour.” At that time, the baroque style of this painting was out of favor, and it may have been a kind of cast-off given to the US Jesuits. They installed it in their university in the Bronx, where it remains today. 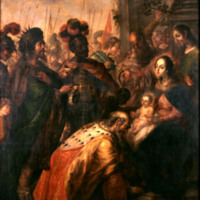 The scene would have been well known to viewers, not only through its numerous representations in narrative paintings, but also through performances of religious plays, where the visit of the Magi would be reenacted, as well as sermons about the kings given on Epiphany, the Church holiday falling after Christmas that marks their visit. Paintings like this one not only reinforced in viewers’ mind the great narratives of the Church, they also gave viewers an opportunity to imagine themselves as witnesses to divine events, akin to the multi-ethnic group that Villalpando crowds into the left side of the painting. Gutiérrez Haces, Juana et al. 1997. Cristóbal de Villalpando, ca. 1649-1714. Mexico City: Fomento Cultural Banamex, Instituto de Investigaciones Estéticas, Universidad Nacional Autónoma de México. Soberón, Arturo. 1997. Cristóbal de Villalpando: el pincel bien temperado. Mexico City: Consejo Nacional Para la Cultura.